Bubbling carbon dioxide through indicator solution to show how it lowers the pH of ocean water. The recent adult day camp, Exploring our Environment: Facing the Future, took place in the town of Marineland, Florida. Dr. Maia McGuire, the UF/IFAS Extension Sea Grant agent for Flagler and St. Johns Counties organized and taught several sections of this 4-day class. Kaitlyn Dietz, the Coastal Training Program Coordinator for the Guana Tolomato Matanzas National Estuarine Research Reserve (GTM) hosted the program at the GTM’s Marineland office. She also taught portions of the class. What’s an adult day camp? Adult day camps are multiple-day programs (typically in a single week). They use a combination of lectures, demonstrations and hands-on classroom and field activities. 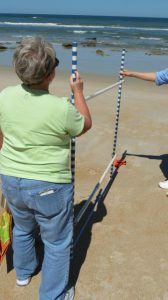 They teach adult audiences ways to help protect coastal environments in northeast Florida. How is climate change affecting local areas? The overall focus of the progm was climate change. Globally, we know that average air and sea temperatures are rising. Sea levels are also on the increase, and extreme weather events seem to be becoming more frequent and intense. These have caused extreme changes to local barrier islands over the past two hurricane seasons. Class participants learned about factors that contribute to sea level rise, and investigated differences in sand from a variety of beaches. A panel of managers from different agencies explained how they were having to adapt to climate change. They also revealed their “lessons learned” from the recent hurricanes and provided some advice for future storms. Their recommendation? Listen to emergency management, and follow evacuation orders. We took beach slope measurements at Marineland Beach and were able to see that much of the sand that had been lost during Hurricanes Matthew and Irma had returned, at least in the sub-tidal part of the beach. The beach slope at Marineland Beach. Much sand was lost during the 2016 and 2017 hurricane seasons, but sand is coming back on the lower beach. How can residents adapt to climate change? Julie Allen from the Florida Forest Service explained the wildfire risks that are associated with both drought and thunderstorms (lightning). She provided information about the Firewise program. This can help residents reduce the risks of property damage in a wildfire situation. One of her main recommendations is to keep a 30-foot “defensible space” around the home. This buffer area should not contain highly flammable items. Those could allow sparks to get up into the eaves of the building and trigger a fire in the attic or crawl space. Dr. Todd Osborne from UF’s Whitney Lab for Marine Biosciences gave a presentation about living shorelines. He explained that the use of plants and oysters can help prevent coastal erosion and can even help build shoreline as water levels rise. 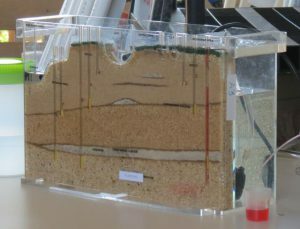 An aquifer model showing how pollutants can be transported by groundwater. Learning how to calculate how much water is applied by a lawn sprinkler. Dr. Jennifer Mitchell from the St Johns River Water Management District and Sol Looker, UF/IFAS Extension Flagler County horticulture agent encouraged participants to conserve water–both inside and outside the home. April is water conservation month, and Jennifer challenged the group to try and reduce their water consumption by 10%. Ideas that people expressed a willingness to try included capturing cold shower water (as it warms up) and using it to give to pets or plants. Another idea suggested (for those who have newer dishwashers) is to not rinse dishes in the sink but to use the rinse setting in the dishwasher instead. Participants learned how to calculate how much water their sprinklers are applying. They also learned that they can check for clogged sprinkler heads by comparing the volume of water that collects in different parts of the landscape. An aquifer model was used to demonstrate that well-water use or application of pollutants by one property owner can impact others around them. How might plants and animals be affected by climate change? Changing temperature patterns could have major effects on the timing of flowering and other reproductive events. Since the gender of reptiles can be determined by the temperature under which their young develop in their eggs, warming temperatures could also cause shifts in the male:female ratios of some species. Many disease-causing organisms are more virulent in warmer conditions, so disease outbreaks could increase as temperatures warm. “Tangled”–a green sea turtle recovering at the Whitney Lab Sea Turtle Hospital. Cat Eastman explains how the sea turtles are cared for at the Whitney Lab’s sea turtle hospital. A visit to the sea turtle hospital at the Whitney Lab introduced us to the disease called fibropapillomatosis. This viral disease primarily affects green sea turtles, causing warty tumors on soft tissues. The Whitney Lab’s hospital was created specifically to treat this particular sea turtle disease. We learned about some of the research that is being done to learn more about the disease, as well as the treatment process for affected animals. Tiny plastic pieces found in the digestive tracts of 23 washback sea turtles that died after Hurricane Matthew. We ended the week by learning about plastic pollution in the ocean. This is a problem that is expected to increase because of the growing amount of petroleum-based plastic that is manufactured each year. Single-use plastics and mismanagement of plastic waste are both major contributors to the plastic problem. The class learned about the pledge that the Florida Microplastic Awareness Project suggests people take to reduce the amount of plastic waste they generate. To be notified when the next adult day camp is scheduled, please email Maia McGuire.